Nothing like a molecular experience to recover the neurons in place! Be smart, clever and fast because the other chemists will not leave you a chance! 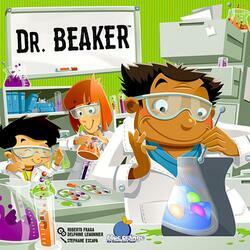 Help Dr. Beaker finish his experiments! Use your stick to move the molecules in your vial and methodically make the objective card. The first player who collects 10 objective cards wins the game. After Dr. Eureka and Dr. Microbe it's Dr. Beaker's turn to put you to the test!